"There were absolute truths I could not uncover until I did the Art." That just about sums it up for me! What does being an Artist~Healer mean to you? Artist-Healer is integrated into my whole life, everything I do. I honor the elements of my art, work, life as having equal impact way beyond me, even though it was my own healing journey that led me to this way of working. As I heal myself, I heal others…as I teach and guide others in process, I am teaching and guiding myself. Circles and individuals work with me, they explore their depths, engage healing journeys, find their myths and shine their light. Then they share their healing and light out into the circles of people that they influence. The ripple effect of sacred journeying, which is how I approach my work, is aligned with a calling and deep purpose. One that is available in one form or another, to each of us. I have gotten more comfortable with and understand the nature of Artist, Healer, and Artist-Healer, the profound power of this work, in my own life and in the world is amplified. Have you always identified yourself as BOTH an Artist and a Healer? My path to reclaiming my life after almost loosing myself in a marriage and raising children, brought be back to being an artist. It took me a long time to claim artist, in fact for many years I only wanted to claim teacher/guide, because I was working from a perspective that was more linear. I was able to claim Artist, when I understood that it was the language and modality of sharing my gifts, transformative arts became the container that was big enough for many mediums and dynamic integration of process. Why do you think it is often difficult for Artists and Healers to claim this title for themselves? I think it is hard to claim new edges in general, relationship, work or part of life that seems “too big, too bright, too much” brings up deep vulnerability, old messages of fear. In my life, this is a call to enter the wounded place. It look me a lot of time, working with art as my language and unraveling my shadow stories, to discover flow in entering the places of confusion, pain, grief and intensity. When there is shame and shadow material blocking the path, I find that this is an opportunity to discover what has been ignored, disowned or relegated to the depths of my subconscious…AND if it is bubbling up in my life then I need to tend to it. I tend to my self, spirit and psyche, through art making, first, then I can see what it is that is emerging and make informed choices about what is possible. For me, unraveling and diving deep into the psyche has been the most illuminating part of healing, it is the place of claiming personal power. Do you think all Artists are Healers or all Healers are Artists? Explain. I think all people are Artists of Life. Being an artist is, for most people, an inside job. 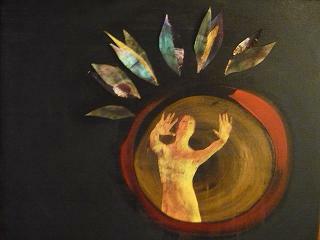 One of the reasons I am drawn to intuitive and transformative art-making is that process is primary, over the product. Accessible and evocative, art as a reflection tool is powerful because the content of the emerging art is guiding the self in a discovery process. Art takes many forms and can be channeled in many ways, artists can work in ways that seem very loud, bold, “artistic” while others quietly spin their art in ways that are hard to understand or even notice. Other artists are challenging, provocative in nature, and hard to miss. Some may be aligned in healing, while others are making marks in other ways. I sense that not all Artists and Artists of Life are Healers but they can be if they work within the subtle inner realms and do their ‘inside healing’ work first. It is that healing energy, subject matter and self-knowledge, that can be tapped into and translated though each of our lives and art…but it does require discernment, wisdom, the ethics of a healer/leader and the ability to meet others as a clear, channel or conduit. (I share about this in the audio). What are some difficulties or challenges for Artist~Healers? There are a few that come to mind. The work I do as an artist-guide includes a great deal of coaching and the journeywork lends itself to translating art into life, working through shadow material and challenges. The rhythm of being an artist can be challenging, energy can ebb and flow and creating can be tangential and hard to make sense of or track. This is an area that is often better understood with deeper understanding of personal cycles, styles of creativity and flow. There can be wounding that occurs through the energetic openness of the artist-healer, where feeling emotional pain and opening beyond the self may be overwhelming. Many artist-healers are sensitive and highly intuitive, working in this way can be challenging and confusing without support and the language to understand how to set new boundaries and create supportive structures. I have found that these are the ongoing areas that require attention, self-care, the willingness to dive back into the healing journey and being with others can be a powerful way to continue learning the newest lessons of life! How does your creative expression inform you, or offer you unique perspective, as a Healer? I do my work in layers and multiple perspectives, and have found that this is the most informative way of being in the world and this work. 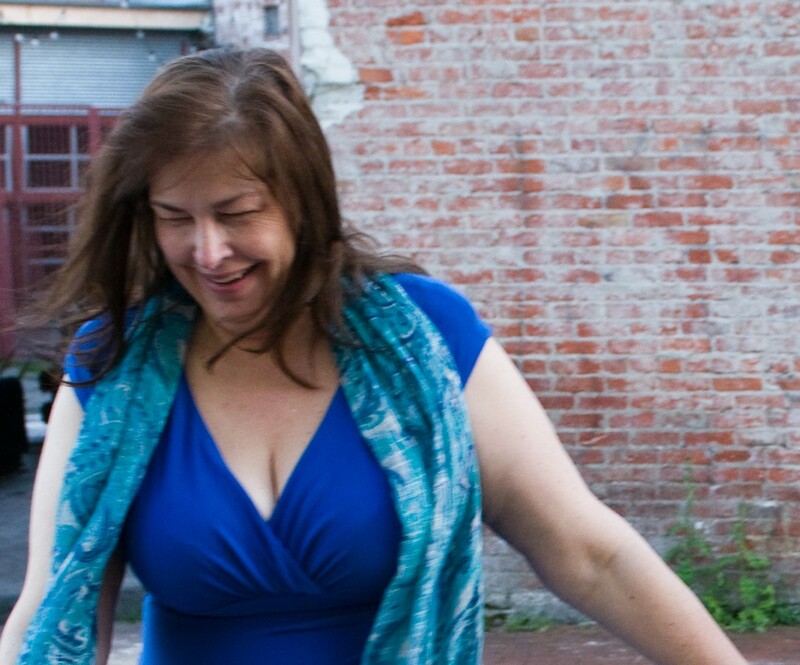 I teach and guide others incorporating theories and process that have become so integral in my life, Part of Self, Dialoguing, Layered Journeys and translating my art, the material of life, into many forms. I look for clues in my art, sometimes in the form of symbol, image and color, other times landscape of life, sensation, emotion that rises to meet me…I follow these clues and create into them, more pathways that open into uncharted territory. I also incorporate dreamscapes, intuited wisdom, storytelling, archetypes and patterns of connection. I have has some of my most profound moment of creating in guided journeying, accessing insight from guides, animal totems, younger selves and threads of stories that follow me from my ancestral roots and find me in sacred place. What unique offerings and services do you feel Artist~Healers have to offer people of the world in our times? This is enormous, because I think that all of us are feeding the spirit of healing back into our future. The more we can engage and teach and guide this work, the more ripples. There is not one person in my life that has not been changed, as I became and claimed and lived into being an Artist-Healer. Being an Artist-healer meant taking full responsibility for my wounded places, the stories I lived out and how I impacted the people around me. Knowing the wounded places, understanding my assumptions, unconscious and shadowed beliefs, embracing the inner part of self that were not cared for, allowed me to be truthful and in integrity with myself. This layer of healing was necessary for me to experience, in order to serve others. At this time, what do you see as your true work in the world related to Art and Healing? Guiding others through their own Mythos Journey and Depth Coaching…working with all of the complexities and challenge of the human experience, to find the places of deep wisdom, claiming new possibility, purpose and living into life. 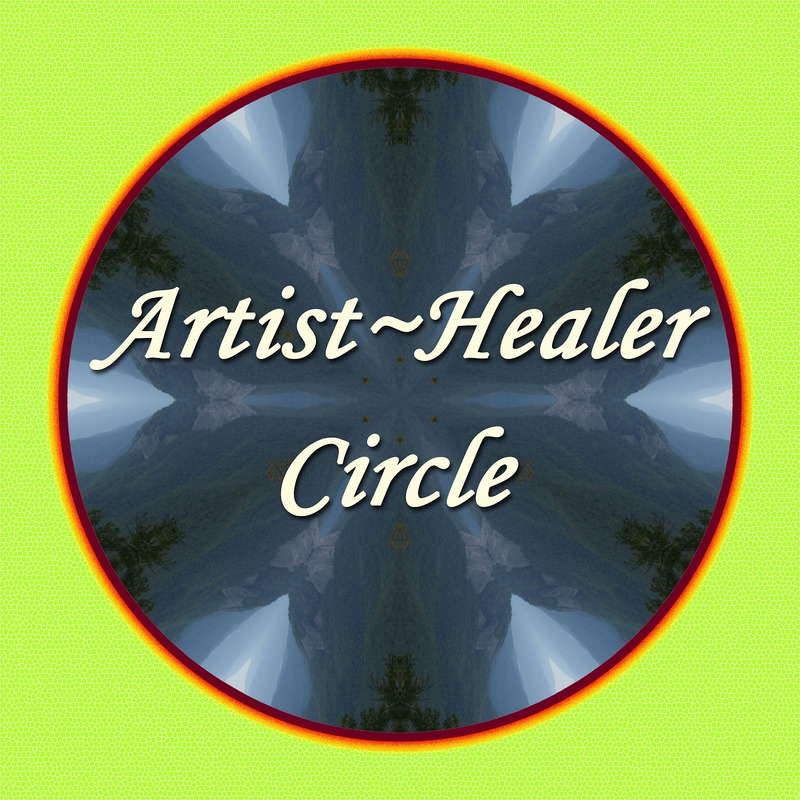 Has anyone had major influence or impact on your journey of discovery as an Artist~Healer? Kaleo Ching, a mask-artist had a powerful influence on me, showing me the way of guiding and healing through journey. Share a true story or experience highlighting the relationship between art and healing, and how this had a profound impact on you or someone else. Through guided visualization, chanting and drumming I entered into sacred place. I entered through a niche of a tree that was shaped like two sides of a teepee. As I pulled my body into the tiny space, it felt cave like. I became part of the tree and found that within the tree was the stone of the cave. The sinews that lashed the hides together, to form the teepee, pulled at my muscles. I felt as if I was merging with the space. The interior walls asked to be covered with symbols and forms—and mountain lion came to me as my guide and spoke to me. She gave me a gift of a hairball, the huhhuhhuh of her coughing up the hairball, magical… necessary…it held essential golden threads of information and to be holding a hairball made me laugh. The feeling of my body in the tree and against the cave wall, helped me to translate this experience in a visceral way. I created art from the cave, the teepee and a place of new knowledge. I made the mask of my wild cat, and marked a wounded place with a porcupine quill. The art, the initial information and the unfolding, deepened my awareness. The connection and reflection was linked to me inexorably. It rose within me and I knew its nature. It came from before me and through me. It became my own life. With this wisdom and language of the soul, I fell back into myself. Do you have any services or projects upcoming that you'd like to share about? I have a wonderful eWorkbook and Audio on working with Parts of Self in Art + Life, this includes theories that are useful in transformative art and process, and my own take on Spectrum of Self and Council Circle. Many Mythos Journey global tele-classes/eCourses are offered throughout the year, with specific themes and areas of focus. Where can readers find out more about you or connect with you?